CALLING ALL STITCHERS OF PIECES OF EIGHT! Joyce continues, "Little did we realize that an avalanche would follow!" A virtual tidal wave of submissions of their renditions of "Pieces of Eight" arrived from stitchers from all over the U.S., Canada, Europe and even Bermuda. Joyce continues, "Literally hundreds of pictures were submitted and, to have shown them all, would have required devoting an entire issue of the magazine just to them. As it was, four additional pages were added to the magazine to accommodate the entries chosen. We plan to show other submissions in the magazine from time to time and many will also be posted on the magazine website." The introduction to the Gallery of images displayed in the magazine's July/August issue states, "Pieces of Eight - just the sound of these words conjures up exciting images in our heads...images of old coins, Spanish Galleons, a brave new world, marauding pirates, romance on the high seas." Stitchers used Gayle's "Pieces of Eight" design as a springboard to access their own creativity and ingenuity - exactly what Gayle envisioned. Below are the variations on "Pieces of Eight" stitched by the members of the Bermuda Guild of Stitchery, which we present as a special tribute to the design's creator, Gayle Bicknell. Kathy Faries, past President of the Bermuda Guild, tells how the Pieces of Eight project evolved, "It was actually at one of our monthly stitch-ins that we were discussing how wonderful the magazine, needlepoint now, was and Barbara Cuoco commented that she would love to do the 'Pieces of Eight' project. Everyone agreed. Ten members signed up for it. We ordered the threads and the rest is history. 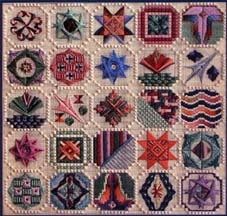 The fact that needlepoint now was going to feature the different interpretations that each stitcher came up with, spurred most of us on to finish by the deadline. The piece itself lends itself to creativity, to use your own personal choice of colors, threads, and designs. It was a joy to stitch!!!" Each of the stitchers interpreted the design differently, resulting in incredibly diverse and personalized variations. 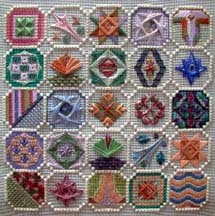 Barbara Cuoco rearranged most of the octagons, embellishing many with beads in her colorful rendition. She then filled in the small diamonds with a gold design. Shina Lyons used blue canvas and also rearranged some octagons. Sue Simmons changed many of the colors suggested and used different threads as well in some areas. 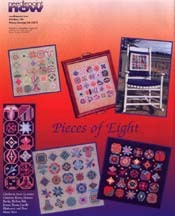 She also eliminated 2 of the octagons and repeated the designs from 2 others she especially liked. 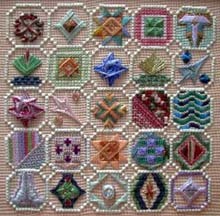 Wilma Frith used pink canvas, rearranged the octagons, and created some new designs for her octagons. Gail Rego used green canvas and decided she wanted to fill in the background of each octagon. She also added stitching in the diamonds adding a very finished look to the piece. 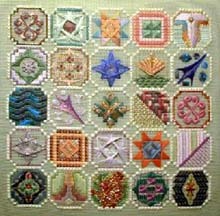 Judy Khoo, stitched her Pieces of Eight on green canvas and designed some of her own octagons using different threads. Kathy Faries used blue canvas instead and switched the order of the octagons. She employed some different threads than those suggested substituting ones in stronger color tones. 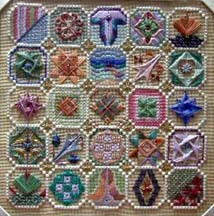 Note: Four Guild members, Barbara Cuoco, Kathy Faries, Shina Lyons and Sue Simmons, completed their projects by the deadline and their pieces were displayed in the July/August issue of needlepoint now. Members, Judy Khoo, Gail Rego and Wilma Frith, finished their pieces subsequently. 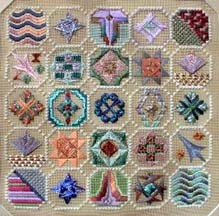 The Caron Collection extends congratulations to them all and would like to thank the members of the Bermuda Guild of Stitchery for sharing some of their history, group activities and projects with us, to be included to this special tribute to Gayle Bicknell. its distance from other land masses, has made its inhabitants resourceful and dependent on each other. For some 60,000 people, we don't do too badly under either of those headings. Our inhabitants come from Canada, America, the Caribbean, the United Kingdom, the Azores, Portugal and other European countries. 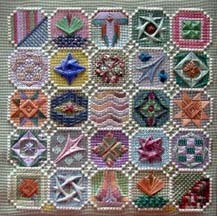 Surprisingly, there was no guild of stitchery until 1994, when a Canadian immigrant, one Nancy Brown, a long-time member of the Toronto Guild of Stitchery, gathered together a group of friends and set the ball rolling. A church hall was found and a meeting advertised in the Royal Gazette, which everyone reads if they want to know what is happening on the Island. Soon after, we were off to the races! many new projects have evolved as a result of our Guild President's attendance at the regional meetings. These meetings have resulted in making many new friends and providing stimulating ideas. Bermuda is hot and humid in summer so we operate from October through June. The last meeting consists of an Annual General Meeting, lunch and a display of members' work. This provides an opportunity for our day members and those of the evening group to meet and see each other's work. We try to balance our meetings with workshops and lecturers from abroad. The former have included items as diverse as Christmas decorations, Tamari Balls, shadow embroidery, learn-a-stitch samplers and origami. Amongst the latter, we have welcomed Beverly McInnes, Maggie Glossop, and Anna Marie Winter from Canada, Beth Russell from England and Anthony Minieri is booked for May 2002. We are planning to continue with this type of exposure and stimulation. Fortunately, Bermudians travel almost more than any other people in the world and our members travel to courses on both sides of the Atlantic, so we co-opt them into passing on their knowledge. We have discovered a wealth of talent amongst our own membership. We hold tightly to our Bermuda heritage. Our newsletter is named the Bermuda Longtail, a beautiful migratory bird who arrives in the spring heralding the warm days to come. Our logo is the little bright blue flower called the "Bermudiana" which adorns our letterhead and our membership pins. We hold one-day marathon stitch-ins at a local hotel twice a year. We have stitched gifts for a local charity to sell at their Christmas craft sale. 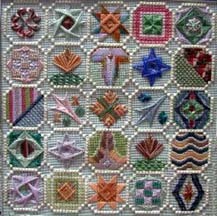 Several members have or are currently taking EAC Correspondence courses in Blackwork, Crewel and Deerfield embroidery. Our members have run courses for senior citizens and younger members of the community. Wherever possible we try to live up to our aim, "To encourage and promote the practice and knowledge of the Art of Embroidery in all its forms and to develop a fellowship of persons interested in needle art in Bermuda." It is hoped the above will give you a taste of Bermuda. If you want more, please come and visit us! You can be assured of a warm traditional welcome from the Bermuda Guild of Stitchery. Note: This profile of the Bermuda Guild was written by member, Brenda Younie, and provided to us by Kathy Faries, past President for the last two years. Sue Simmons took over that position as of June 30, 2001. Kathy has been the editor of the Guild's newsletter for the past five into the present.